How to complete the Sentry 4 secret near the fireplace on The Farm. 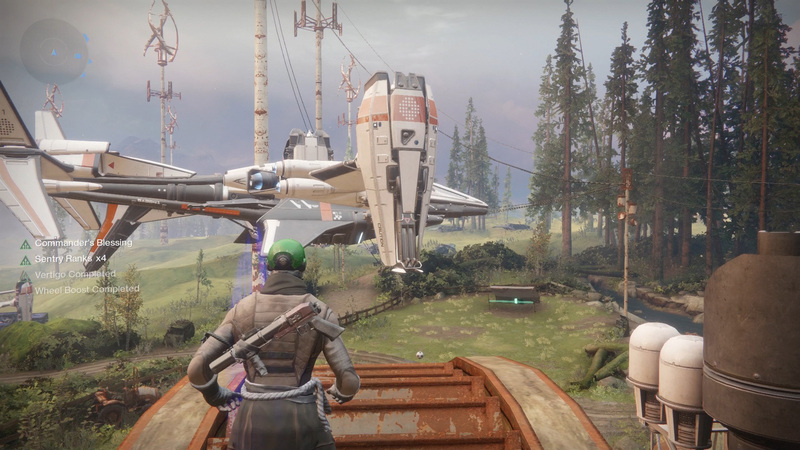 Bungie have included all manner of hidden things to do across Destiny 2, and one just so happens to be in the new Social Space. Once you reach The Farm and explore, you’re sure to discover the fireplace near the river that says it requires Sentry 4. This is a special event that takes you all around The Farm on a Scouting Patrol. 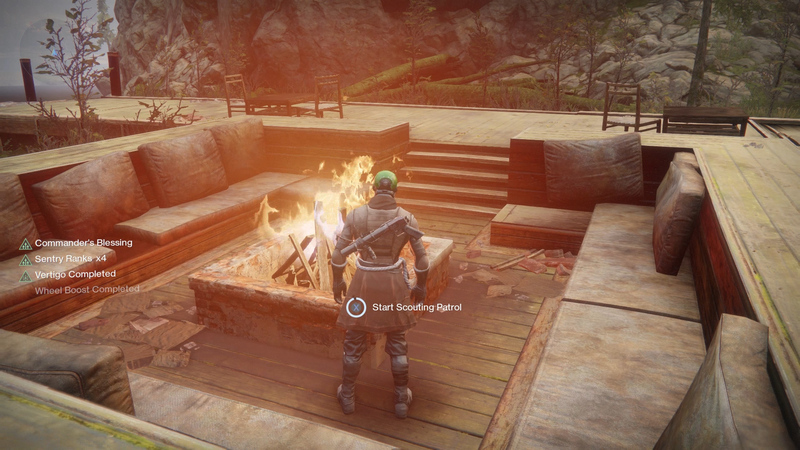 The "Requires Sentry 4" fireplace near the river is the starting point of a short time trial that tasks you with running around The Farm and hitting checkpoints to get the quickest time possible. In order to begin the Sentry 4 Scouting Patrol, you will first need to do a few odd tasks around the Social Space. 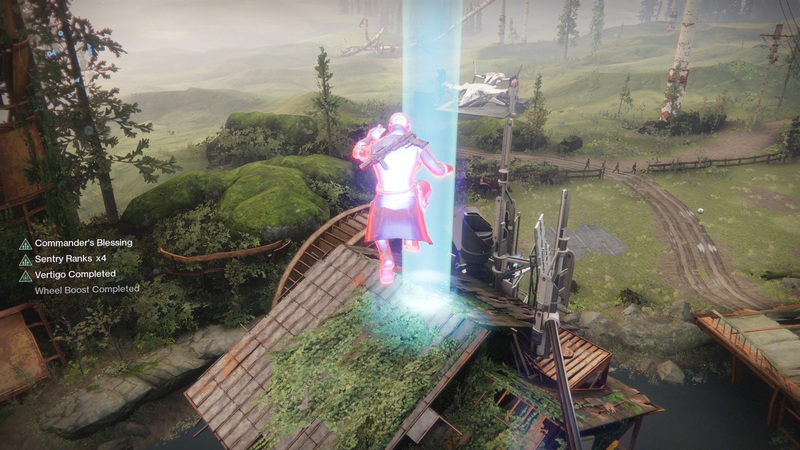 Get to the top of the roof near Hawthrone to begin the Farm's Sentry 4 secret. 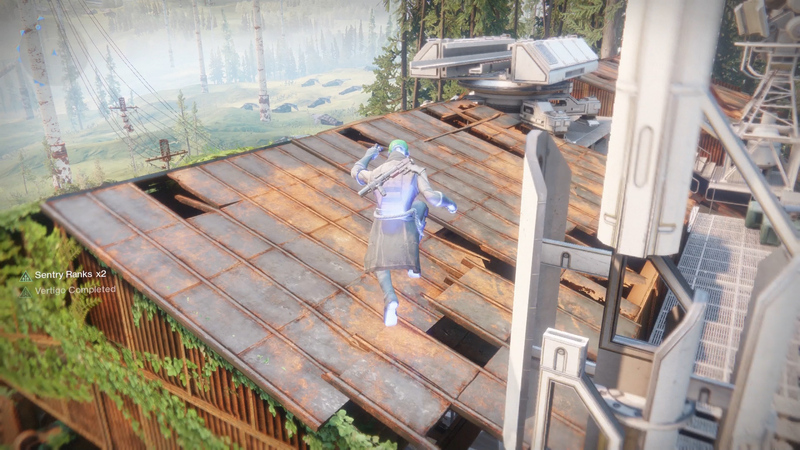 You can begin by making your way onto the top of the building where you find Hawthorne. You can reach the top of this building by starting near the Sentry 4 fireplace and climbing to the top of the building in front of you. Once at the top, use the cables to reach the top of the other building. 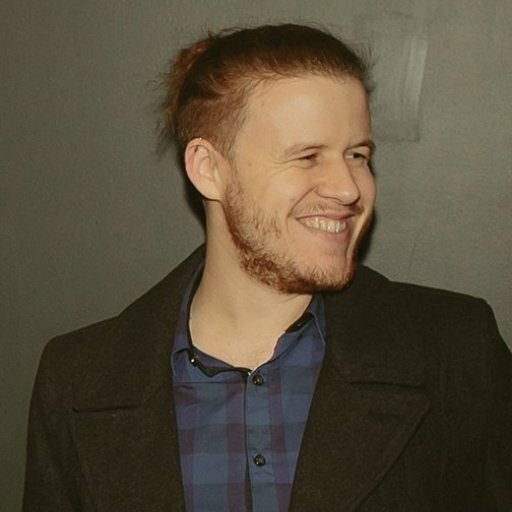 It’s here that you will receive a buff called Sentry x2 and Vertigo Completed. Go for a walk on top of the mill's wheel to reach Sentry Ranks x4. From here, head over to the mill’s water wheel and climb to the top of it. You can do this by standing on the side of the football field and jumping onto the center of the wheel then onto the roof. Stand on the wheel and walk as it spins, this will give you Sentry 4. Activate the bonfire to begin the Scouting Patrol. Take the Sentry 4 buff back to the fireplace and you can now begin the Scouting Patrol. As soon as you start the Patrol, you will need to make your way through 9 beams of light in order to complete the course. Race around The Farm, through the beams of light, to finish the time trial. The route will take you behind the building near the fireplace, onto its roof, over to the mill, down onto the bridge, into the building near Hawthorne, out to the spawning area, and finally down to the pier. Successfully completing the time trial will show how fast you were able to do it. Be careful, as you are moving at high speeds and can jump to great heights, making it easy to die from fall damage. If you do die, you will need to repeat the steps to get Sentry 4 again. Once you finish the time trial, and providing you are the only one who has completed it, you will receive the Scouting Commander buff, which will help the other Guardians around you complete the Sentry 4 Scouting Patrol on The Farm! Now that this little secret is out of the way, learn how to get Exotics in Destiny 2 and be sure to check out our Destiny 2 hub for more guides and secrets!